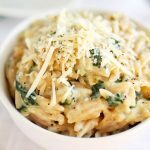 This quick and easy parmesan spinach orzo pairs well with chicken, fish, or as a standalone dish! This post contains affiliate links, which means if you buy something I’ll earn a small commission at no cost to you. Thanks for supporting Life As A Strawberry! When I was little, I always gave my mom a hard time about making orzo. I picked a fight every time we ate it because “it’s not pasta, it’s rice!” and would have to sit there and (un)patiently listen to her tell me that it is, in fact, pasta. It was a whole big thing. But I’m over it (sorry, Mom). Even though it still LOOKS a lot like rice. Just saying. And make orzo I did. 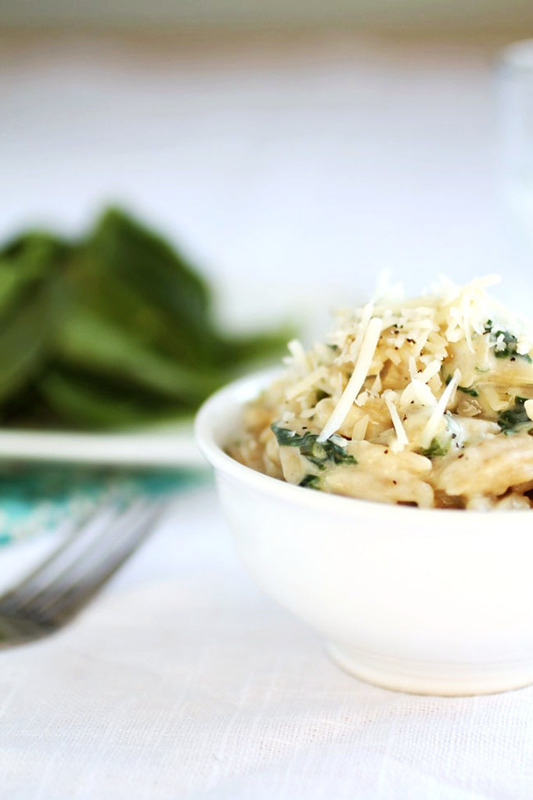 This parmesan spinach orzo rice pasta is great because it is quick to make but still flavorful. Annnnd it has parmesan cheese. Which means I am instantly a fan. Plus, it’s a great, light side dish for pretty much anything. Pair this orzo with chicken, fish, meat, or a side of grilled veggies. 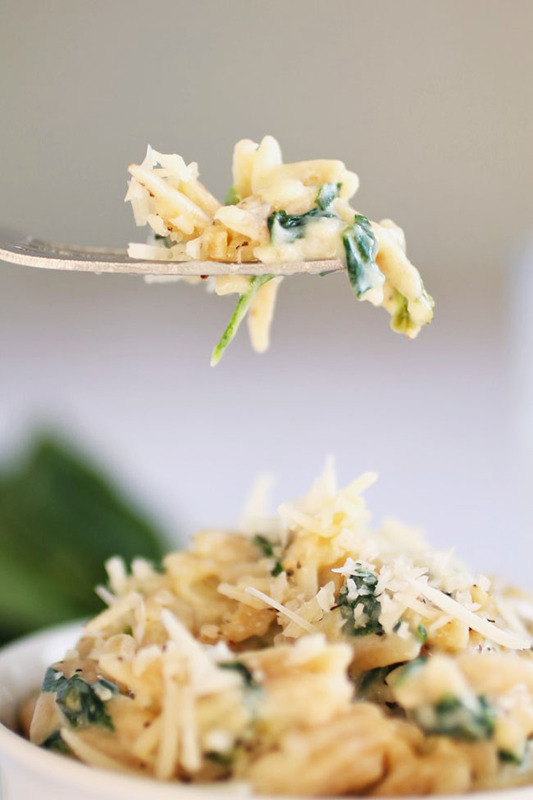 This spinach orzo has quickly become one of my favorite go-to dinner dishes. It’s a great, quick side dish, but it also tastes great when you double the sauce recipe and toss it with some grilled fish or chicken. Want to make it even heartier? Add steamed broccoli, peas, or any other veggies you have on hand to the mix. 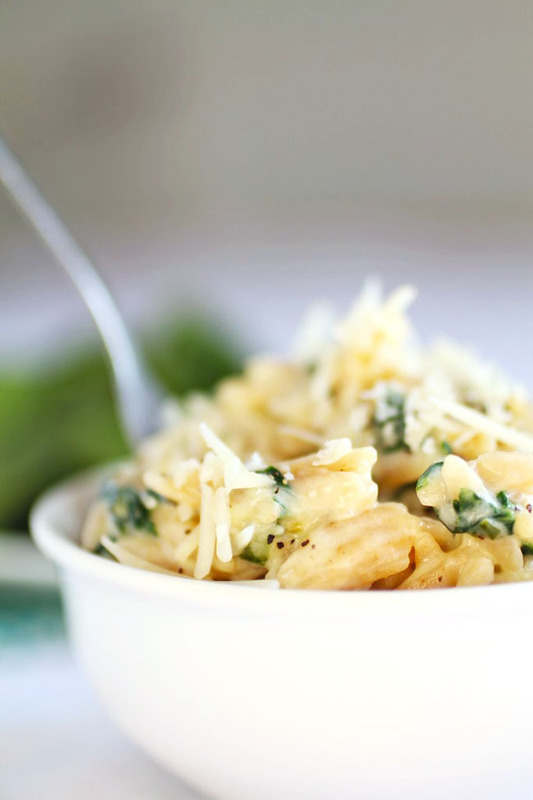 An easy parmesan spinach orzo recipe for busy weeknights. Cook orzo according to package directions. Drain and set aside. Heat olive oil in a medium-sized pot over medium heat. Add onions, garlic, salt and pepper and saute for 1 minute or until onions are translucent. Add flour to pot, stir to form a roux, and cook for an additional minute. Add milk to the pot a little at a time and whisk constantly to work out any lumps from the roux. Bring to a simmer and cook until sauce has thickened, about 8 minutes. Add chopped spinach to sauce and cook an additional 2 minutes or until spinach has cooked down. Remove sauce from heat. Stir parmesan cheese into sauce. 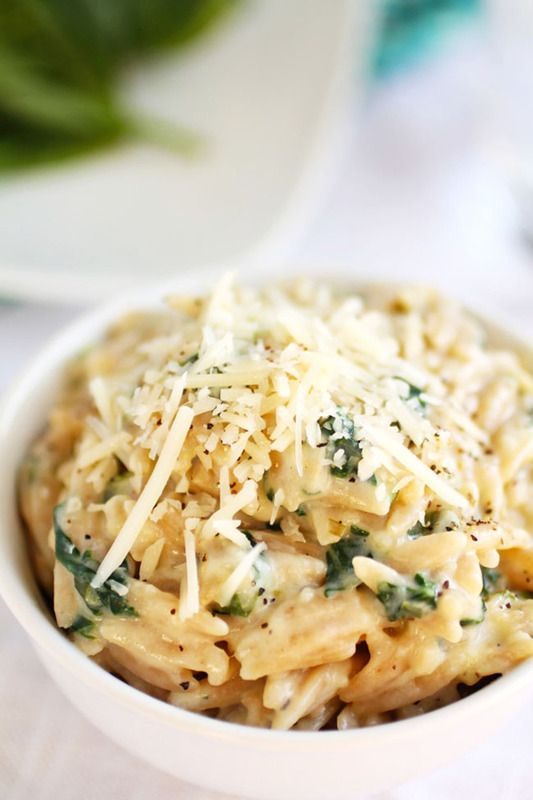 When cheese has melted, add cooked orzo to sauce and toss to coat. Garnish with extra parmesan cheese and serve immediately. Add chicken, shrimp, sausage, sautéed mushrooms, broccoli, or any other veggies you have on hand to this orzo to make it a little heartier. This recipe makes just enough sauce to cover the orzo. If you’d like a little more sauce, reduce the amount of dry orzo by 1/2 cup or add a bit of extra milk to the sauce during cooking. If the sauce is too thin, let it cook for a few extra minutes. Too thick? Add a splash of milk to thin it out. Use shallots or yellow or white onions in place of the green onions if you like. Would absolutely love to try this recipe, but unfortunately (as someone else commented) the only ingredient showing is the orzo (3 times!). Can you fix the recipe please? Something must have happened to the ingredient list. Would love to try making it. There was a glitch with my recipe plugin, but I reloaded it and it should be working now! Thanks for letting me know – I hope you enjoy the orzo! The only ingredient listed is the orzo (twice). I would really love to make this for dinner tomorrow. Can you send me the recipe? I reloaded the recipe and it should be working now! Just made this for dinner! Super yummy! My husband and 2 year old absolutely loved it!! Thanks for sharing! I’m glad you liked it! Thanks for letting me know how it turned out! Oh no looks like this recipe got messed up! The ingredient list just lists the orzo 3 times. It looks like my recipe plugin decided to misbehave! I reloaded it from my end and it should be working fine now – thanks for letting me know it wasn’t working! This was fabulous! I didn’t use all the orzo I cooked cause I didn’t want it to be too pasta heavy and I added chicken. Also realized I was out of milk so I substituted light Alfredo sauce I had. Sooo good! I’m happy to hear that you liked it! I love adding chicken to this orzo – thanks for letting me know how it turned out! 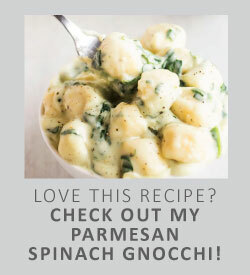 Great recipe – my husband & I loved it! *It may be helped to specify “cooked” or “un-cooked” orzo. We decided to go with 2 1/2 cups COOKED orzo & that seemed to be a good ratio of pasta to sauce, but I think specifying either way would be helpful for people following your recipe. Thanks! Thanks for the feedback! I’m glad you liked the orzo!